Our baby bluebirds fledged today, but it wasn’t all fun and games for one of the babies. Each summer, since putting up our bluebird house, we have had a nesting pair of Eastern Bluebirds on our back deck. Each summer, they have at least two broods, and one time three. 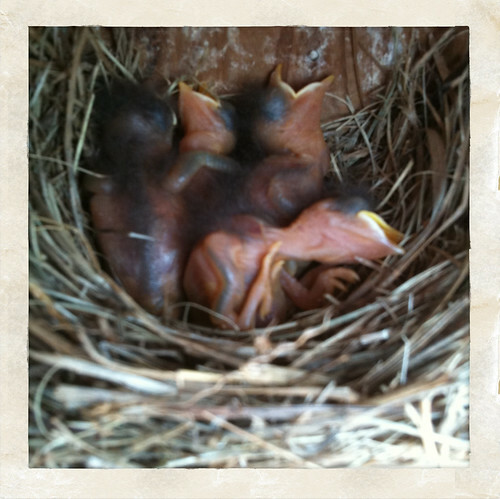 We have only had one bad egg out of all the broods hatched in our bluebird house, which is 10 feet from our back door. The bluebirds that spend time in our yard get very accustomed to our comings and goings. They don’t seem to have any problem when we decide we want to use our back deck either. In fact, they sit on the feeder poles 10-15 feet away from the nest when we check it. Last year, the mother bluebird flew up to our back door in what seemed to be a panic. She was making quite a ruckus, and it was obvious she was trying to get our attention. 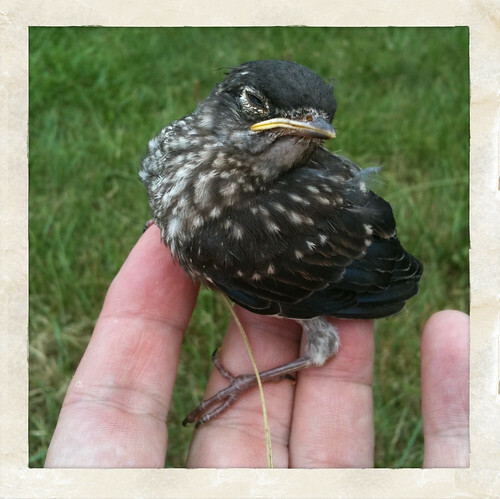 We quickly noticed that one of the the babies from their first brood had fallen from the deck before it was ready to fly. Based on her reaction, I did not hesitate to go outside to pick it up and bring it back up to the deck to place it back in the nest. Ever since that day, we have seemed to enjoy a special bond with the bluebirds on our back deck. This afternoon, we noticed both the male and female bluebirds hovering over the same spot in the yard. I checked their nest and sure enough, the babies had fledged from the nest, right on schedule. I grabbed my shoes and walked out into the yard to find one of the babies hiding behind a blade of grass (it wasn’t camouflaged too well). After a brief observation it was clear that the baby couldn’t fly, but I couldn’t tell if it was due to the tall grass in that section of the yard, or if it just wasn’t developed enough yet. The parents flew to the bushes nearby and waited patiently. I picked up the baby to examine it. I wanted to make sure it wasn’t injured. I tried to place it on a low branch of one of our snowball bushes, but it wouldn’t let go of my fingers, so I snapped the following photo with my iPhone. After a brief rest, the baby was ready to try flying again. As I placed it gently back where I found it, the mom and dad started hovering over it again, trying to persuade the little tyke to take flight. It’s brothers and sisters were flying in and out too, in an obvious sign of support. As the sun set tonight, after an afternoon of numerous flight attempts, that baby was still sitting in the tall grass by the old swing set, and its parents were still perched on the top of the swing set keeping an eye out for predators. Maybe tomorrow the little bird will find just the lift it needs to spread its wings and fly. They say you can lead a horse to water, but you can’t make it drink. Apparently you can lead a bluebird to the open field, but you can’t make it fly either.